To celebrate the new Baglioni Hotels “Unforgettable Day“ advertising campaign, we have invited Marilyn to share with us her own unforgettable day-long experience in Rome. My visit to Rome this year was all about new experiences. First of all, my brother Michele and his wife Roxanne joined me for a portion of my travels. I was so excited to share my love for Italy and our Italian family with my sibling. I had waited 45 years for this adventure. “My favorite thing to do in Rome is to walk, and walk, and walk,” I said. “There are treasures around every street corner.” I told him that I had been wanting to find San Clemente Church. He corrected me by saying it was more than a church. It was a Basilica. I was about to pull out a map when Ettore invited himself along with me on the beginning of my walk. Of course I accepted. “We go to il Colosseo (the Colosseum) first,” he said. “It looks so beautiful now that it has been cleaned. I will show you which street from there.” It is always so surprising how kind people in Italy can be. Walking with Ettore was a special treat. 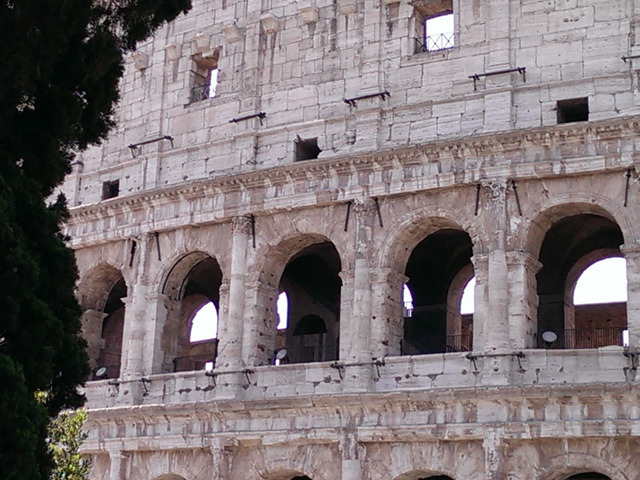 It was blazing hot in June—that was not so unusual—as we strolled toward the Colosseum. The sun shone brilliantly off the newly refurbished building and I fell in love with it all over again. My destination was elsewhere, however. Now where was that church? Ettore pointed to the left at the Colosseum, away from the crowds. We said our goodbyes, complete with a hug and two cheek kisses. 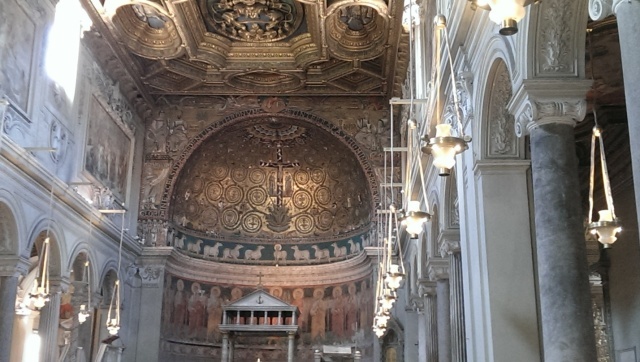 I walked perhaps ½ kilometer to reach the Basilica of San Clemente, where I planned to time travel through the history of Rome. My first steps into the Basilica took me inside a lovely, 12th Century gothic church. Gold leaf, gothic pillars and arches abound. It really is quite lovely. And it does feel like you have stepped into the past. But I wanted more. In 392, St. Jerome had referred to the Church of Rome as having preserved the memory of St Clemente. It wasn’t until a Fr. 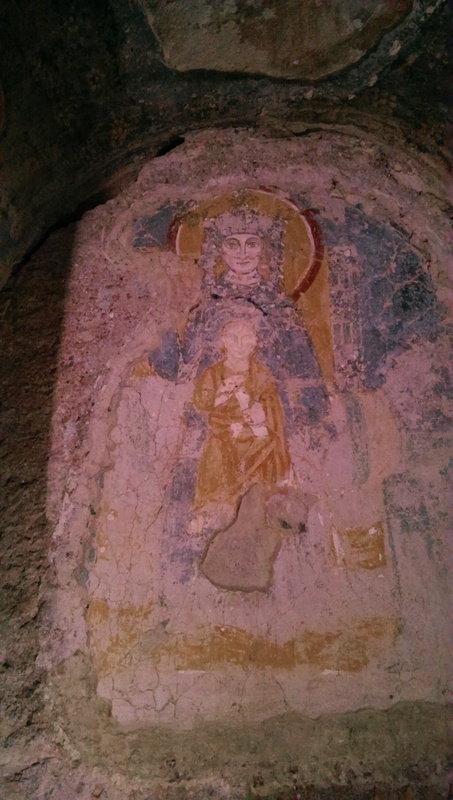 Joseph Mullooly began excavating below this church in the 19th century that it was discovered that St. Jerome was talking about an entirely different church built in the 4th century. He found it underneath the gothic version! I began my journey down a flight of stairs into the past. From the moment I descended alone into this darker, damper world, I could almost feel the ghosts of the early Christians worshipping on this holy ground. They also used anything and everything at hand to create their structure. 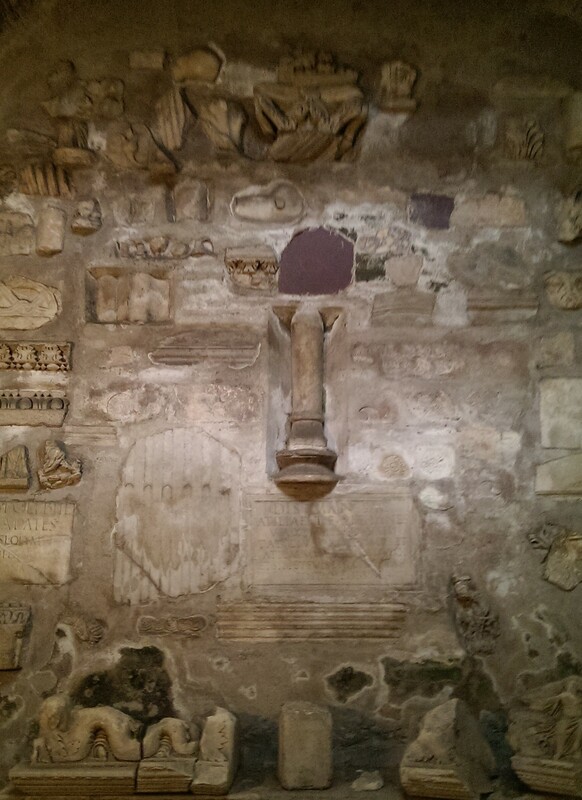 The pieces of Roman buildings completely enhanced the experience. 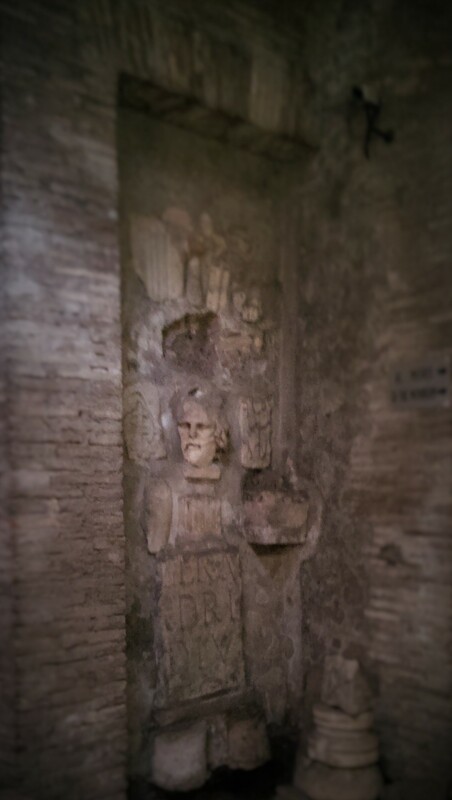 There seemed to be an old Roman centurion standing guard too. And the artwork still held its color. As I walked on alone a few more travelers appeared. We all were in awe of the preservation of this 4th century place of worship. Wait, there was more time travel to come. 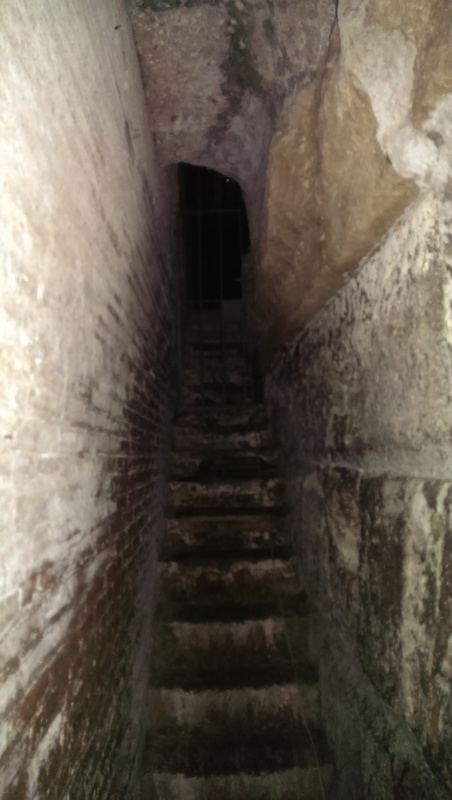 Down I ventured, deeper into the history of the Romans, the history of my own Italian family. 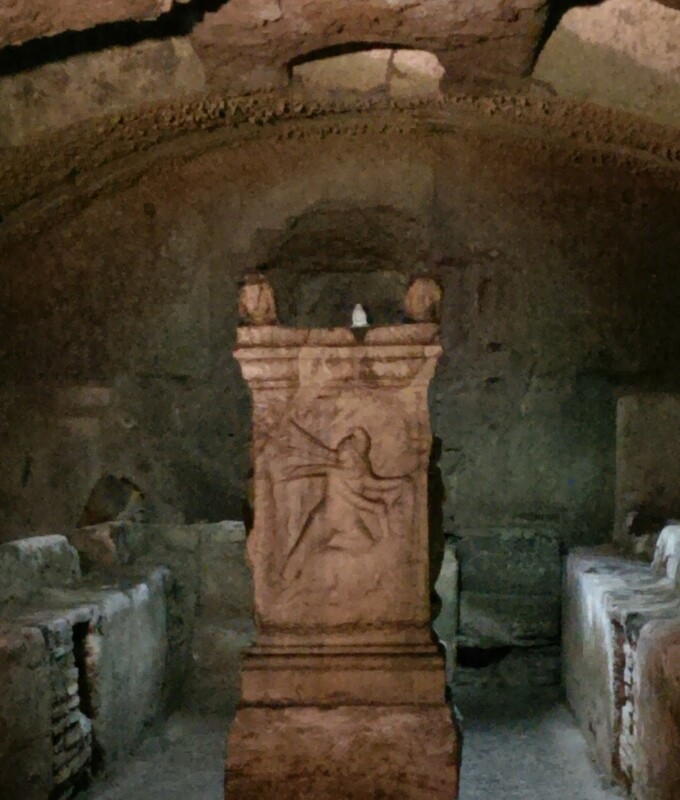 Below the 4th century structure the remains of a 1st century Roman commercial area that had been converted into a 2nd century Temple of Mithras had also been discovered. I had no idea what to expect. 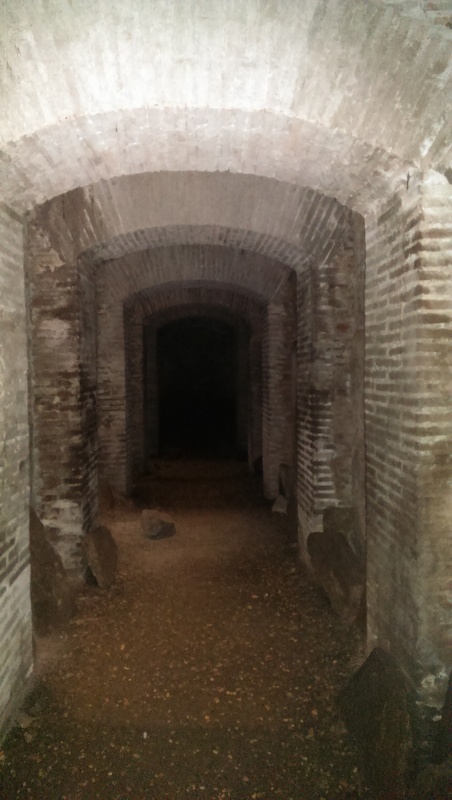 It was extremely cool and clammy down here, and spooky too. At first I was entirely alone in the lowest level. It was eerie. It truly felt as though I had somehow traveled elsewhere. 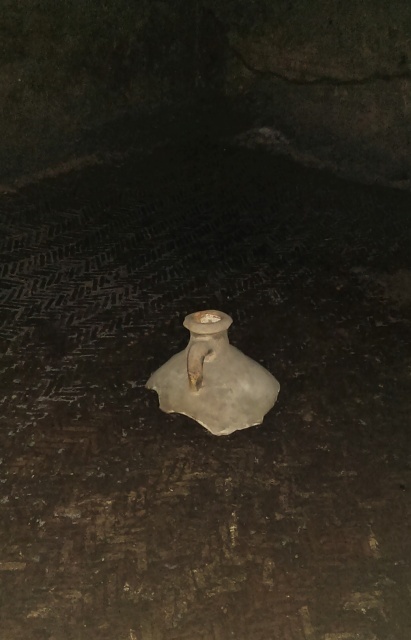 Somehow the herringbone patterned brick and this broken jug exemplified the feeling of the 1st century for me. As did this long, arched walkway into the past. Romans walked here daily, worked daily, bought and sold. Later in the second century they worshipped here. Mithras, bull jumping, what else went on where I was walking? As I climbed back up to the current Roman cityscape I felt the centuries returning. 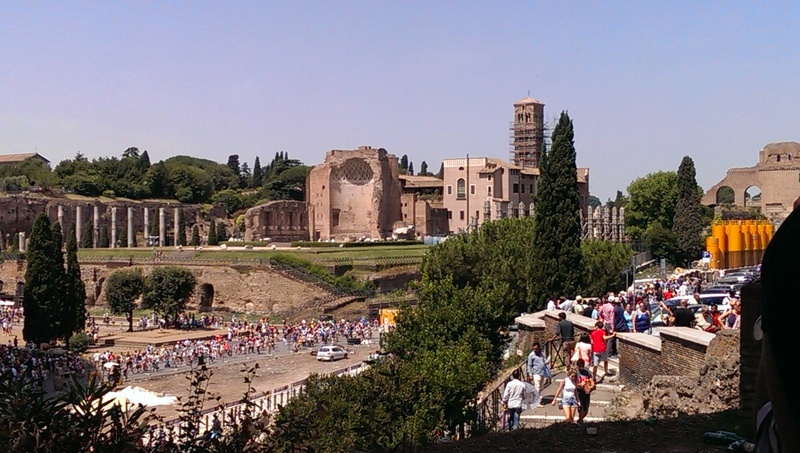 I left the basilica and walked by Roman ruins, the Colosseum again and joined the huge crowd of tourists. I wanted to prolong this feeling of treading in ancient history, even with a myriad of noise, cars and people. 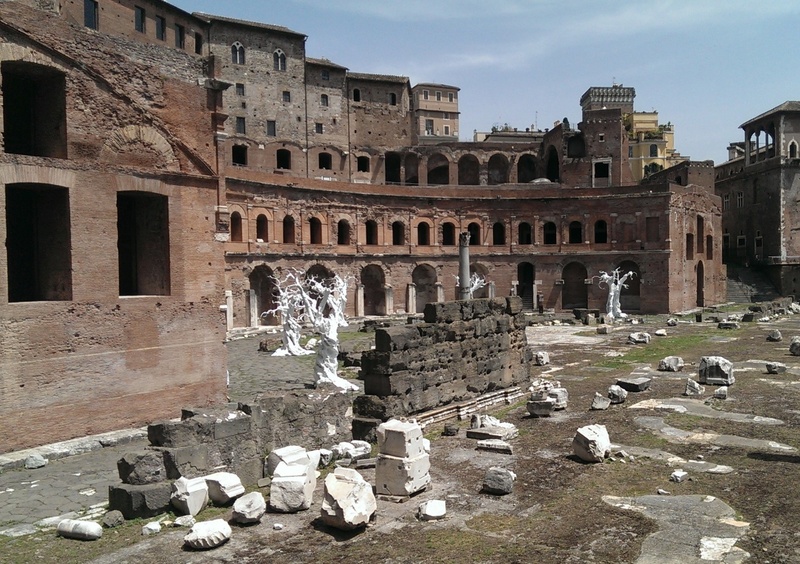 I walked past the forum, refilled the water bottle I always carry at one of the free Roman fountains, and strolled all the way to Trajan’s market where I sat in the shade. I encountered many other travelers with the same idea. I especially loved watching the families with young children as they climbed on the rock walls, giggled and chased one another. I am certain this same behavior was common in ancient Roman times. I am Italian-American. I have family in Rome and I feel my heart belongs to Italy and, maybe, the Roman Empire, especially today. I thought about what my brother and sister-in-law were experiencing as they toured this great city. They were discovering what it is like to be a Roman, a real Italian. And tonight they will meet some of our Roman family for the very first time. After a bit of rest, more water, and chatting with other travelers, I began my walk uphill to meet Michele and Roxanne at Roma Termini Train Station. Since I was early, I wandered inside that huge station for more than 30 minutes. It seemed as though representatives of every nation were inside that steamy train station. It was peaceful, beautiful and filled with a cacophony of languages echoing off the concrete walls. We met downstairs and took the metro to the Tiburtina station where our cousins, Adelina and Daniele, awaited us. They hugged and kissed my brother and his wife as if they were both prodigal sons! 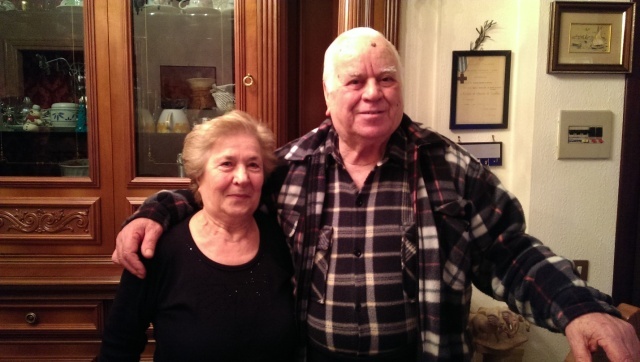 They drove us to meet their parents, Vincenzo and Celeste. This family was the first family I met in Italy 45 years ago. Sharing my love for them with my brother meant the world to me. And I knew both he and his wife would be enriched by the experience. Celeste and Vincenzo greeted their new family members with hugs and kisses. They do not speak English at all. I found myself translating with my limited Italian as Vincenzo informed me how my brother was more beautiful than I was. Therefore, he would sit next to Michele at this meal. He also thought Roxanne was lovely so she would sit next to her husband. Vincenzo had that devilish look in his eyes I have come to expect. We all laughed and sat at the table. Our aperitivo included prosciutto, cheese and fresh figs. And wine of course. We talked about our family in the USA and our family in Rome and Abruzzo while we shared our repast. They had picked up 4 boxes of pizza slices for 7 of us to share for our next course. Every type of topping was available. Celeste dished out 3 pieces at a time on everyone’s plate. Vincenzo had made melanzane (eggplant) rolls for us. This was a new dish for all three of us. He explained how he sliced the eggplant lengthwise, soaked it all in oil and let it sit for hours. Then he lay each piece on a board, layered cheese on top and rolled every piece up. Each roll was placed flat in the rectangular dish, covered in homemade tomato sauce and baked. It was delicious! My brother fell in love with our Italian family and the country of Italy as I had done so long ago. It was like time circling back to when I first arrived in Rome in 1971. The sincere pleasure of meeting our long lost relatives and theirs for us coming all the way to see them, well it was exhilarating. And, for me, sharing it with my sibling was priceless. What an unforgettable day in Rome. Sono una donna fortunata! I am a lucky woman! –Marilyn Ricci is 100% Italian-American and dual citizen of Italy and the USA. In the past she has been a professional vocalist, Real Estate New Construction Specialist and Jackie of all trades. Today she is the founder of Take Me Home Italy, a travel planning business offering exclusive, personalized travel for anyone who wants to experience the true Italy. It also specializes in assisting Italian-Americans to find their home of origin. Follow her on Facebook and Twitter. Her greatest accomplishment in life has been being the mother of her daughter and La Nonna to her granddaughter. Her next goal: moving to Italy in January of 2017. Concierge Tip: Want to experience your own #UnforgettableDay in Italy like Marilyn? 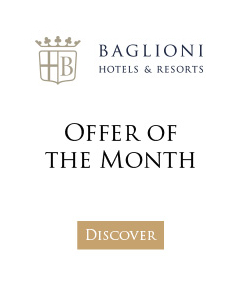 Then be sure to enter our contest for your chance to win a 2 night stay in a luxury suite at Baglioni Hotels by describing your own dream day in Italy. We invite you to visit and Like our Facebook page where you will find full details of this contest (until 8th September 2016 only).